← Favorite chocolate cake gets snapped up at Holiday Helpings! For the WordPress Weekly Photo Challenge, the word this week is Layers. And I’m reminded of a bakery I came upon while strolling S. Main Street in Grapevine, Texas: Legacy Cakes Bakery! Layer cakes filled a showcase inside with cakes for weddings, showers, and special occasions. 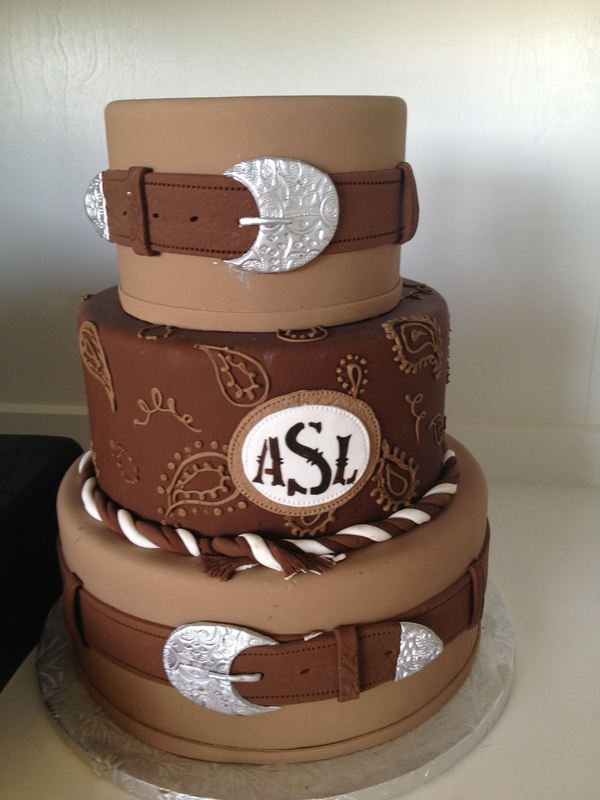 Like this one that definitely speaks Texan to me: Western elements — belt buckles, rope, paisley print and monogrammed logo — in one tastefully layered cake! More great cakes await you on the Legacy Cakes website. Some layered. Some sculpted. All creative! This is post #15 of National Blog Posting Month (NaBloPoMo) 2013. This entry was posted in Food, Retail Shops, Weekly Photo Challenge and tagged Grapevine, layer cake, Legacy Cakes Bakery, postaday, Texas, Western cake. Bookmark the permalink. ooh i love that!! so nice. i wish i could decorate a cake like that. I do, too! Thanks for reading & commenting! Wow, some people are so talented! That’s simply gorgeous!! You’re right — talented! I love taking pics of what other people create. With time and patience, I’m sure we could do some of what we see, but it’s actually more fun taking pictures of what we admire and sharing them! Thanks for reading. I love this sweet and beautiful layer post 🙂 Great take on, Rusha! Thanks! Loved this cake, too! Appreciate the comment! Wow, that looks amazing! I’m good at baking cakes, but no good at the decoration. It IS a great cake! I could never do that — not enough know-how or patience! Absolutely LOVE your post. Thanks for sharing it with us! I love to see cakes like these since I’ve never even attempted to do something this labor intensive! Thanks for commenting!